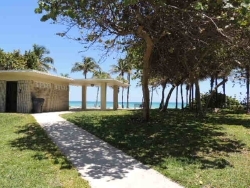 The City of Hollywood has begun the planning and permitting process Phase I of the renovation project on the Stan Goldman Memorial Park which is located at 800 Knights Road in Park East. The dog park will be known as “Hollywoof” and will include 20,000 square feet with a secured fence area for large and small dogs. The park will have dog play and training equipment, fresh water troughs for dogs to take a drink, new pedestrian walkways, theme park benches, waste bins, signage and security lighting. There will be enhance entrance signage, landscaping and road upgrades at Johnson Street and Knights Road. These improvements will make the park more welcoming to visitors. There will be a new paved entrance drive, pedestrian and vehicular entrance gate and a parking lot for 15 vehicles. This parking lot will be for use by people who want to use the existing pavilion and children’s playground. Renovations to the existing restrooms are planned. The planning and permitting of the estimated $375,000 project are now in progress. Construction is expected to begin in January 2015 with the new “Hollywoof” Dog Park grand opening scheduled for early May 2015. This will be a new dog park for Hollywood and add to the four dog parks in the City. Dog Beach which is not considered a park is another place for dogs to romp. This new dog park was one of the top five requested items by Hollywood residents. It has received preliminary Commission approval. A bid has gone out to contractors and final approval is expected once a final bid has been received. Funding for the park is in place.